Sometimes, it becomes necessary to add another HVAC duct run in the house. This is especially common if you remodel part of your basement by adding a room. You need to heat and cool this room, and the most economical solution is to add a duct run from your existing HVAC unit. 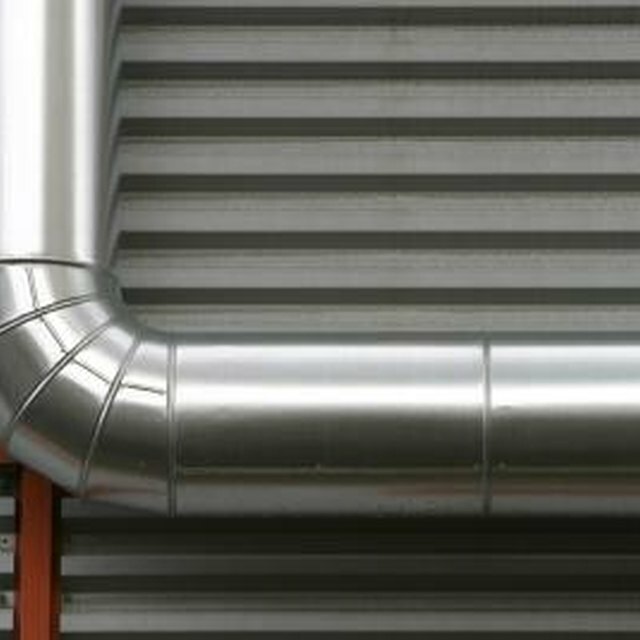 In some instances, it may become more complicated than just adding a duct run to an existing HVAC system, especially if the HVAC system isn't big enough to serve the new space. If all you are adding is a room comparable to a standard-size bedroom, though, it is easy to add a room to an existing HVAC system. Measure the square footage of the room. This is done by multiplying its length and width. Calculate what size duct you'll need by using the following parameters: up to 125 square feet, use 6-inch diameter duct, 126 to 250 square feet, use 8-inch diameter duct, and if above 250 square feet, you'll need to possibly upgrade your HVAC system before proceeding. Measure the distance from the HVAC duct by the HVAC unit to where you want the supply air register to be. Purchase the required duct and elbows from your local home improvement store. Don't forget to purchase a register boot and a register to allow the air to flow into the room. Figure out what ceiling configuration your new room has (drywall or suspended drop ceiling). For a drywall ceiling, move to step 5. For a drop ceiling, cut a square hole in the ceiling tile where you want your register and slide the register boot into the hole. Secure the register to the register boot with screws, and this will lock the ceiling tile into place. You can then put the ceiling tile into the ceiling grid and run your duct work. Install the register boot before you drywall. Anchor it to the ceiling joists. The square portion of the register boot will be flush with the top of the drywall. You then drywall, cut the hole, and install the register into the bottom after the ceiling is painted. Run the duct work from the register boot back to the main duct trunk. Connect it by sliding the crimped end into the non-crimped end approximately 1 1/2 inches. Secure each joint with at least four sheet metal screws. Cut the duct as necessary to allow for needed short pieces. Make sure you crimp one end of the cut duct with your pipe crimper so that it can be connected into the duct system. Connect the new HVAC duct run to the main HVAC duct trunk with a sheet metal collar. This collar is connected to the main duct trunk by cutting a hole that is the diameter of the collar. The tabbed portion of the collar is then pushed into the duct and the tabs are folded over inside. This locks the collar into place. The other end of the collar is slid into the duct and screwed like the previous connections. Support the duct at least every 5 feet by using wood blocking under the duct in the ceiling joist space. The wood blocking will be cut the width of the ceiling joist, slid up in, and nailed into place. The duct work will rest on top of this wood blocking. Wear gloves and safety glasses when working with sheet metal duct work. It is extremely sharp and can cause severe cuts.